Nowhere in Himachal Pradesh have the paths of men and gods crossed each other as in the remote valley of Sangla. 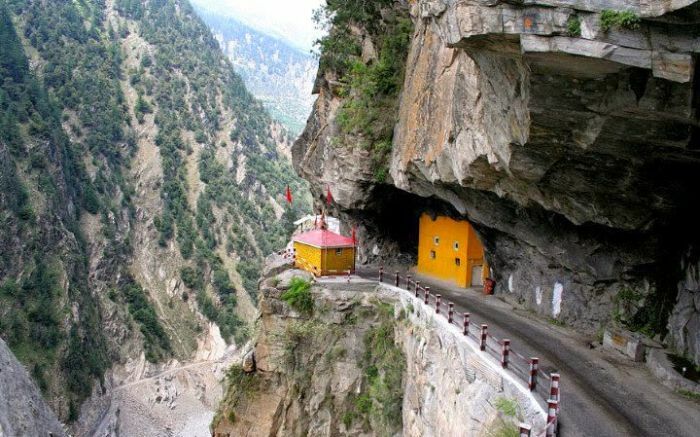 Spurred up in the remote parts of Kinnaur, for sale the valley is eternally guarded by the presence of Kinner Kailash, ask towering above one of the world’s scariest and most dangerous roads, viagra order overhung with giant rocky cliffs and overlooking the hurtling River Baspa. Often, eyes are blinded by reflection of a bright sun, gleaming over rocky barren mountains. Even the surface of Baspa rolls with diamond like sparkles, making it almost impossible to look straight at it. As the valley approaches closer, it dawns that Baspa infuses life to the otherwise barren landscape. Along the River’s banks, terrace fields grow seasonal crops of wheat, rice, and amongst the best varieties of potatoes in the world. Higher slopes are lush with orchards that grow apples, apricot, and wall nut. Just below the snow line, the slopes have an occasional cover of cedar forests run by glacial streams, where trout fish can be found. Remote and rural, the region is dotted with traditional Kinnauri villages where simple village folk are extremely hospitable and rooted in their culture. This is apparent in their dress, music and dance. The dryness of the region gives their faces a distinct parched appearance, quite in sync with the natural environment. Most of them are farmers, with women and children playing an equally vital role in all farming activities. It’s common to see children guiding flocks of sheep and goats to nearby forests for grazing. Houses in the village appear identical, built from stone and wood. They are mostly two storeyed structures with slated roofs. The ground floor is usually reserved for cattle. Many homes still use traditional utensils made of brass, bronze and aluminum. The architecture is rare and renowned for having extensive wooden carvings. 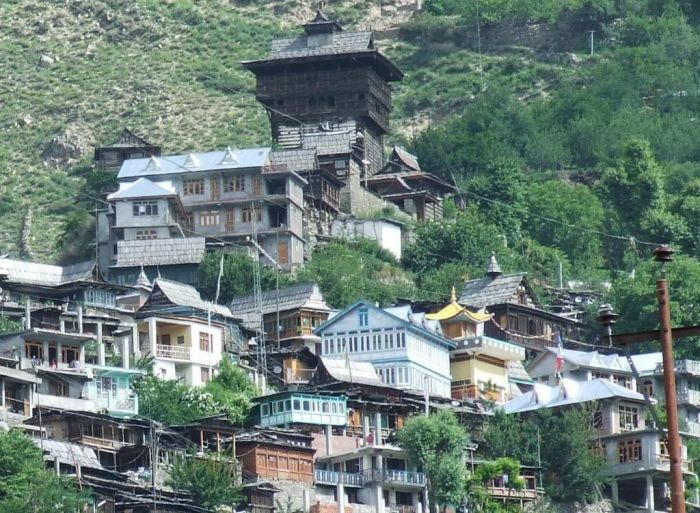 The largest settlement in the valley is village Sangla, to the north of which, clinging to a rocky spur is Kamru – a village famous for its impressive ancient five storeyed temple-fort. This religious fort is believed to be guarding the valley from evil spirits. It is a ritual to seek blessings from the statue of Buddha in the village before entering the fort. The weaponry here remains locked away but the deities, bedecked in colorful attires and jewelry are taken out during festivals. Another nearby village, Basteri is almost time wrapped with paved pathways, slanting roofs of slate with simple village folks tending to fields and orchards. The valley flattens out upstream at Rakcham, some 14 km from Sangla, where trekkers can find excellent camp sites by the river. 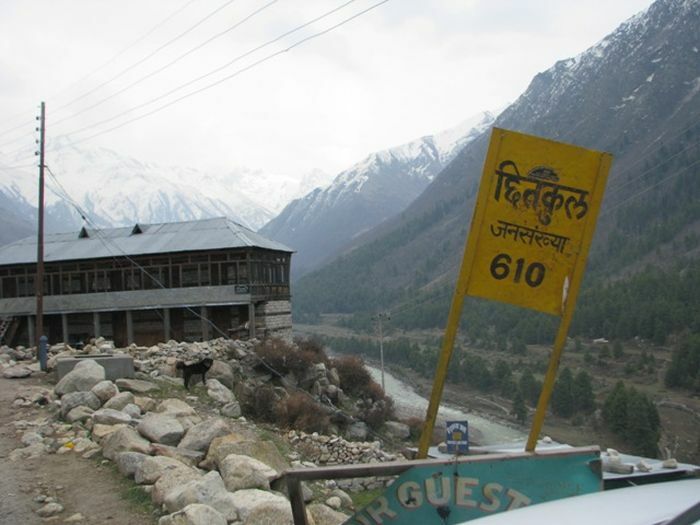 The last village of the valley, close on the Indo-Tibet border, is Chitkul. Here the road reaches a dead end, literally. Mules are used from Chitkul to transport food and essential supplies to the border. 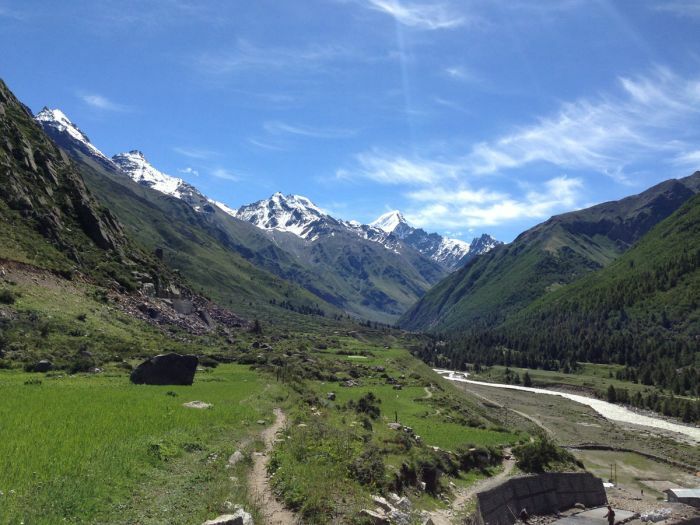 Trekking 24 km from Sangla is a popular way of reaching Chitkul. It displays stark barren mountains where the silence can be haunting. 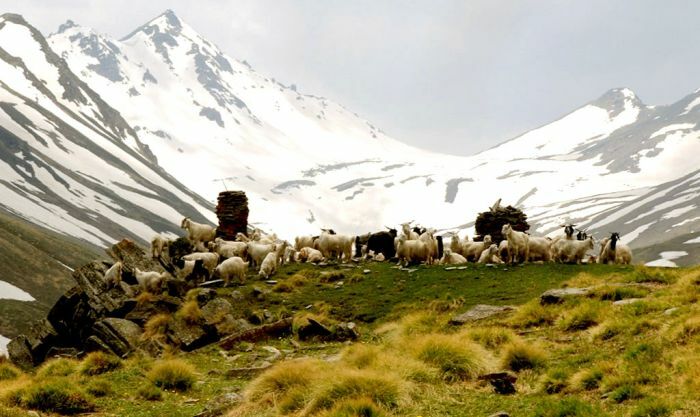 Sangla is an ideal getaway from the heat of the plains. It offers plenty to do and see. Besides angling at Baspa, trekking is most sought after. Trekkers usually eye for the Sangla-Kanda trek. It runs along Rukti Kund and passes through dense pine forest. Occasionally, trekkers come across the sacred Bhoj Patra trees, whose bark was used in place of paper to write many scriptures in ancient time. The summit, even in peak summer, is covered with snow. Being remote, Sangla offers only limited accommodation options. Besides the PWD and Forest Guest houses, a few private guest houses and home stay accommodation has come up in recent years. If you’re an outdoor person, there are several tented colonies, where tents with attached toilets and serving fresh meals are available. 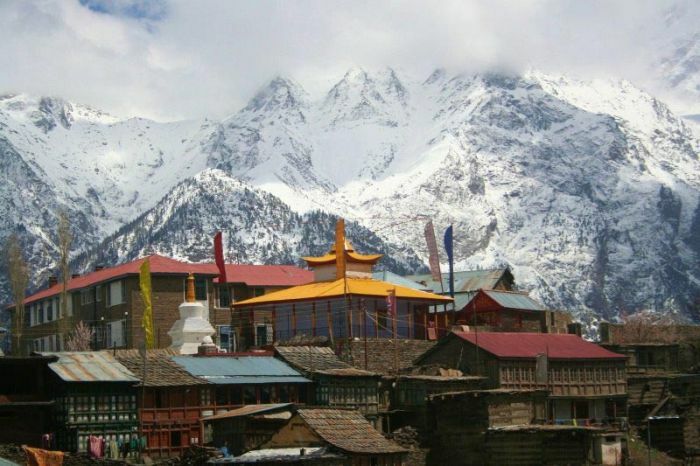 The best time to visit Sangla is between May and June. Till October the weather remains pleasant, after which the valley closes down for winter and receives heavy snow. Sangla is 226 km from Shimla. The road is tough and fairly demanding, especially the last 17 kms between Karcham and Sangla. Pratima Kalra is Content Manager at HMPL. She has industry experience of more than two years. An MBA in Marketing and HR, she loves writing and that’s what brings onboard at Himachal Media. An ardent fan of Ayn Rand’s writings, she believes in doing what you love, and loving what you do. Her thoughts clearly reflect in her writings.